The Drouin side of my family is fairly large. My father was 1 of 10 siblings, most of whom had several children, who have had children and so on. We are all spread out across not just Canada, but some have moved to the US as well. Add in ancient family drama, and the opportunities for us to all get together are few and far between. My cousin Carol, the oldest of all the cousins, decided that enough was enough and organized a family reunion for this past weekend in Niagara Falls, which made it central to the majority. Carol travelled all the way from South Carolina, Liam and I flew in from Halifax and several people drove down from Québec. Carol sharing the Drouin family history after dinner. All together, there were 60 people in attendance, ranging in age from 2 to 96. It was fun to see cousins that I haven't seen in almost 40 years and to even meet some Aunts for the first time. Of the 10 siblings, both brothers - my father and my uncle, have died, and 3 of the sisters were ill to travel. 5 of the sisters, plus my Mom, representing the original family. The best part of the reunion was that it gave us a chance to dress up and take some family photos. 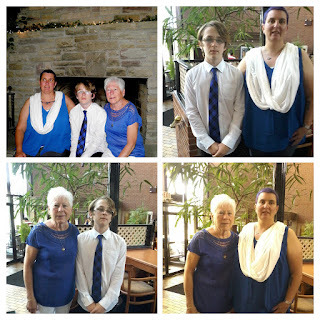 The Drouin family crest is royal blue, so we were all asked to dress in blue and white, which made for some nice shots. I don't know if there is a plan for another reunion, passing the planning and organizing on to the next generation, but if there is one, I'll be sure to go.